Cantaloupes are the same as muskmelons, also called muskmelons. They are very high in nutrients and relatively low in sugar compared to some other fruits. They also contain a large volume of water (about 90 percent). All of this makes them a good food choice to aid in hydration and fulfill your fluid requirements. One cup of melon contains about 60 calories, primarily from carbohydrate. There are about 14.4 grams of carbohydrate in a serving of the melon. You'll benefit from 1.6 grams fiber from cantaloupe, but most of the carbs in cantaloupe come from naturally-occurring sugar (fructose). The glycemic index of cantaloupe is estimated to be about five. If you eat more than one cup of the melon, the glycemic load will increase. There is almost no fat in cantaloupe. Cantaloupe provides a small amount of protein, but this is not a good source of the macronutrient. Cantaloupe is an excellent source of vitamin C, vitamin A, and beta-carotene. It is also a good source of potassium and contains significant amounts of B vitamins. The vitamin A found in cantaloupe is important for eye health. Adequate vitamin A intake can help your eyesight stay sharp and healthy. It also aids in night vision and helps you see color. Vitamin C aids in wound healing and helps your body make collagen, a protein essential to maintaining strong bones and skin. Foods rich in beta-carotene, such as cantaloupe, also provide antioxidant benefits. This may be associated with a reduction in certain diseases, such as heart disease and cancer. Is cantaloupe high in sugar? A common misconception about cantaloupe is that because it tastes so sweet, it is very high in sugar. 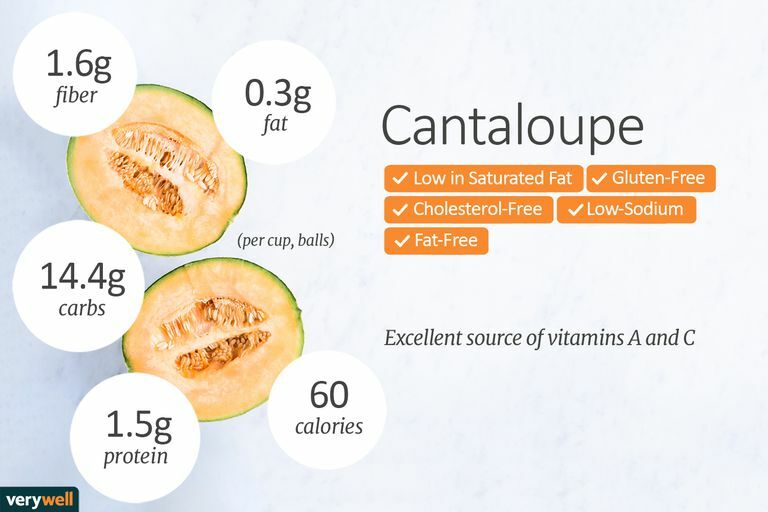 One cup of cantaloupe has essentially the same amount of calories and carbohydrate as one serving of other fruits like a small (four ounce) apple. The key to eating cantaloupe is to keep your portion to about one serving, which is one cup. To help you feel full, pair cantaloupe with a serving of protein, such as one ounce of cheese or a handful of nuts. It's important to wash the cantaloupe prior to cutting into it. Use plain tap water and a vegetable brush. It is not recommended to wash melons with soap. The skin is porous and soap can enter the flesh of the fruit. Does cantaloupe have a lot of bacteria? Cantaloupes are grown close to the ground and can sometimes come into contact with bacteria from the soil, water, and animals. This is a food safety concern. Not only can environmental factors play a role in contamination, but human contamination can also occur during or after harvest. Washing the melon helps to remove any bacteria. Picking the perfect cantaloupe is somewhat of an art form. You can either choose to purchase a cantaloupe that is ripe to be used for immediately or one that needs to ripen at home. If you are looking for a ripe cantaloupe, you should search for three things. Color: The skin under the mesh should be a light orange or cream color. Green indicates an unripe fruit. Stem End: The end of the cantaloupe that had the stem should have a smooth, rounded scar. You want to find the indentation, an indication that the fruit was picked when it was ripe. Blossom End: The other side of the cantaloupe is the blossom end. Smell this part, it should be fragrant and when you press on it, it will "give" slightly. If it is rock hard with very little smell, it's probably unripe. A cantaloupe will continue to ripen for a few days after it is picked. If it is still hard and has very little fragrance, the flavor may be disappointing. Avoid melons that contain nicks or other damage. This is usually a sign that it is a host for bacteria. If you purchase a melon that is not fully ripe, store it at room temperature for about two days. After washing, blot the melon with a clean paper towel to remove excess water. Then cut off the stem end, which is where most of the bacteria tend to collect and throw it away. Wash the knife after cutting cantaloupe and before using it on other foods as bacteria can spread to other foods through cross-contamination. Once cut, store melon in an airtight container in the refrigerator for up to five days. If possible, store it in the crisper. Keep in mind that the riper the melon, the less life it has left before it will spoil. Leaving cut melon at room temperature or in the heat can lead to rapid growth of harmful bacteria on the flesh. If you'd like to keep melon for longer, you can cut ripe melon and store it in the freezer in a freezer bag or airtight container. People with oral allergy syndrome (OAS) may have a reaction when exposed to cantaloupe, according to experts at The American Academy of Allergy, Asthma, and Immunology. Symptoms may include itchiness or swelling of the mouth, face, lip, tongue, and throat and in more severe cases, difficulty breathing or swallowing. If you suspect that you are allergic to cantaloupe or have OAS seek the care of a qualified healthcare professional. Diagnosis may include skin testing, blood tests, and a complete history of symptoms. Parnell, et. al. Cantaloupe: Safe methods to store, preserve and enjoy. University of California Division of Agriculture and Natural Resources. 2003;1-5.